Take the opportunity to grab a brush and some detergent for tires and wheels and give them a good scrubbing. There are a wide variety of brushes and soaps. 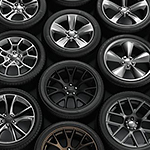 Spend some time finding the one that will do the best job for your particular tires. Once you wash and rinse them well, take a microfiber cloth and dry them. You might add a layer of wheel wax to make them really shine and provide some extra protection. If you ever need repairs on your tires, wheels or other components of your car, stop by Blue Knob Auto Sales so we can help.